Bottling time again, la mise en bouteille. Descending moon is the time for bottling and appropriately Monday was the appointed day, I know other domaines were doing the same. 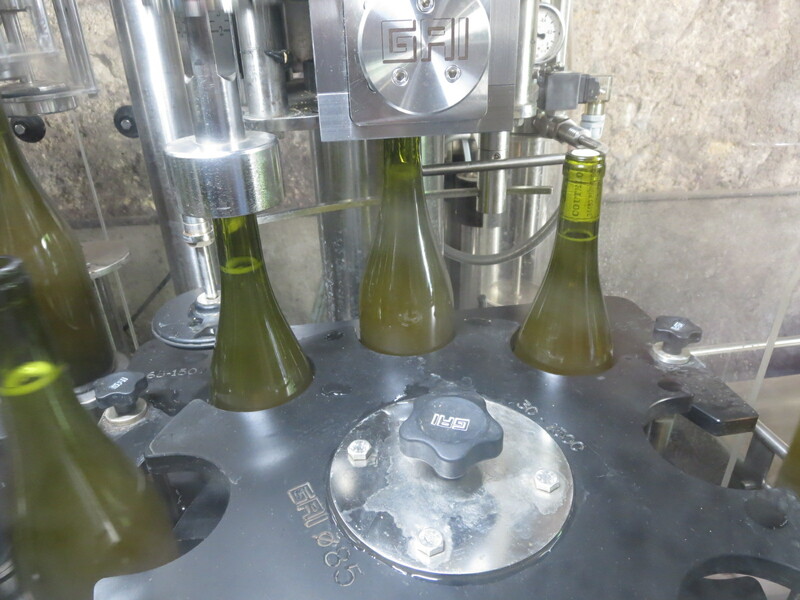 I have described the bottling process before for standard 75cl bottles, Jeff’s own bottling line means that we could at least carry out the process in the shelter of the cellar rather than the full sun and very hot temperatures outdoors. 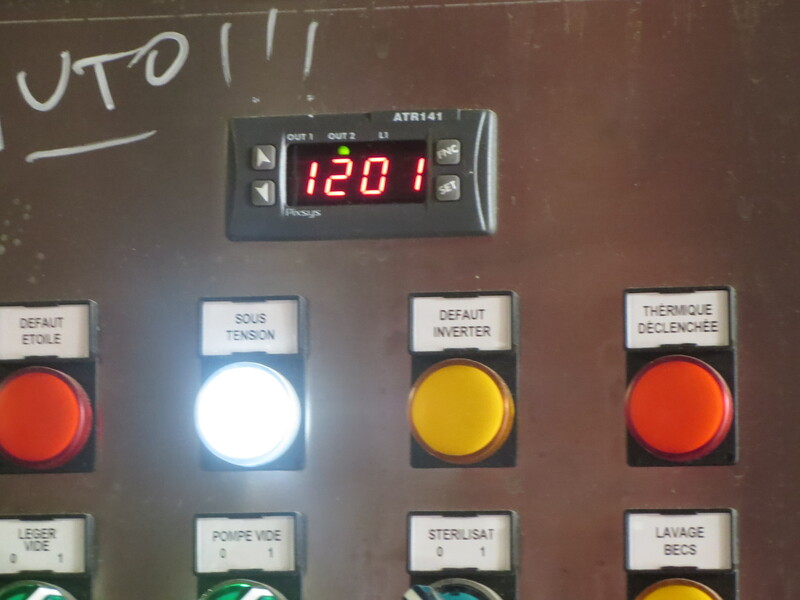 Jeff told me though that he sets the gauge on the bottling line according to the temperature. Hot days like Monday mean that the wine expands a little so you have to actually put a little more into the bottle than normal so when it cools down there is still 75cl of actual wine. And the reverse for cold days. Always learning!! The video below shows the line in action. 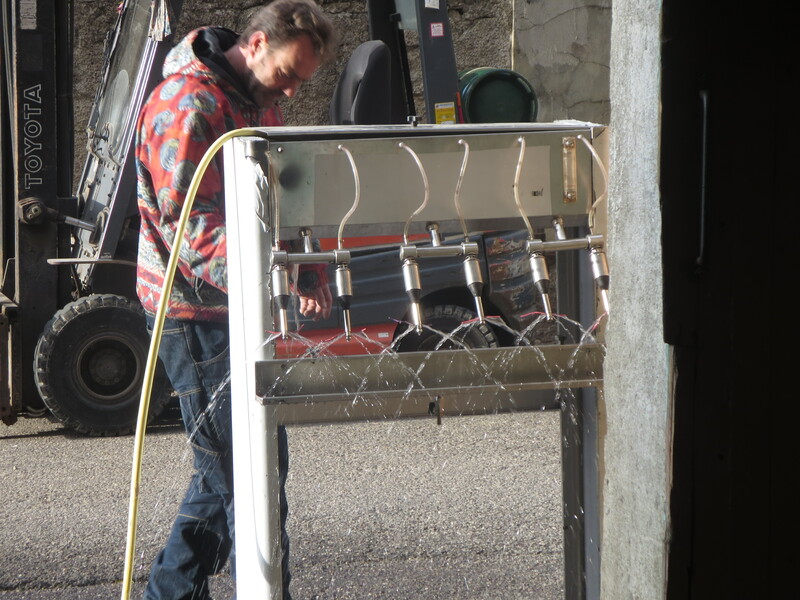 Today was the day for bottling the star wine of recent years, Flambadou the Carignan Noir from Rec D’Oulette. Before that came the Maccabeu 2015 which was aged in different barrels and then assembled recently. 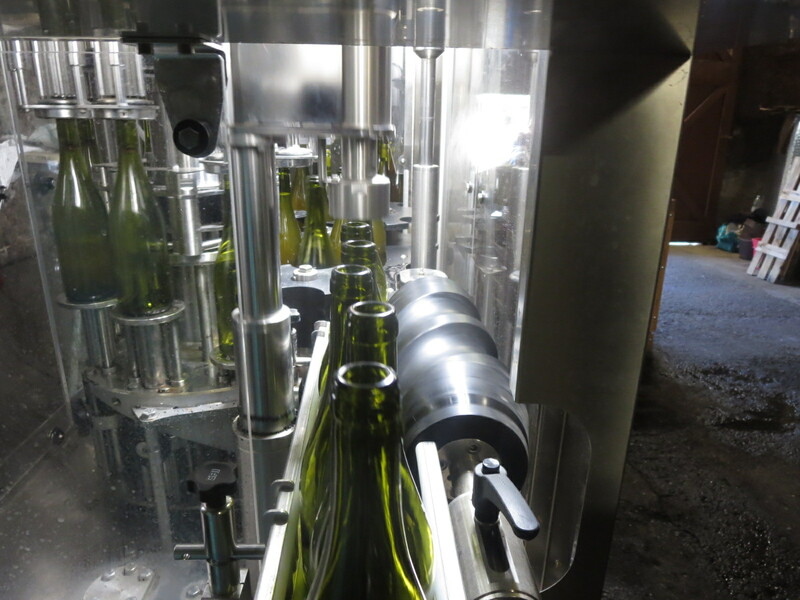 There are lots of jobs to do during the process from putting the bottles into the machine, filling corks, checking levels of wine in the tank (no lees or gunge) to stacking the bottles. Now this latter job is more difficult than it first appears. There are two methods; a pallet with moulded plastic sheets which make the job easy as you lay the bottles in the space provided and then there’s the palox. This wooden crate can store more bottles so is preferable to use in some ways but it is a devil to arrange the bottles in it. You lay the first row down and it has to be level or as you add more layers the crate resembles a stormy sea with bottles sticking up all over the place. I have done this job and believe me it not easy. Vincent here shows how it should be done, a masterclass. 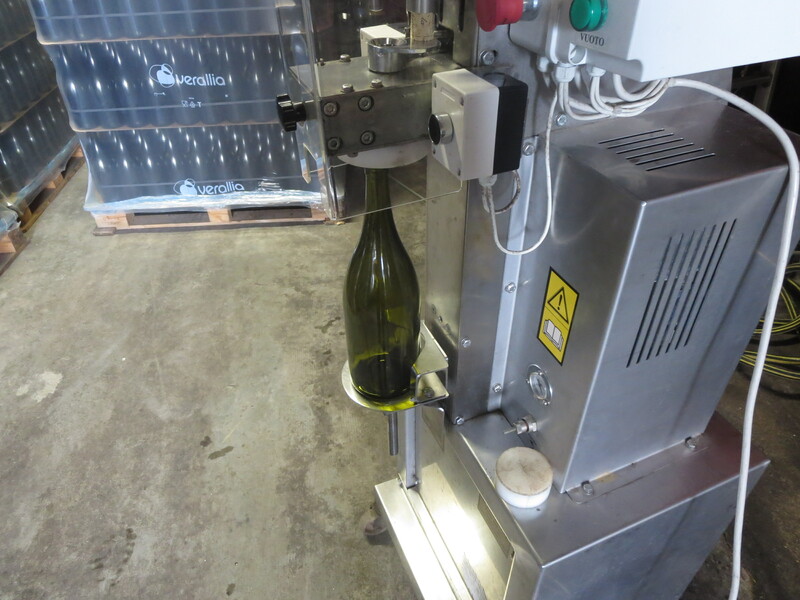 Magnums are too big to go on the bottling line so have to be bottled using a different machine, more labour intensive (the price of a magnum reflects extra costs). Here we can follow the process, note how magnums are stored on end. Afterwards there’s lots of cleaning to be done, the machines but also the cuves from where the wine came, with its lees and sediment. Another tank ready for this year’s harvest whilst last year’s now wine slowly matures in bottle. And on such a hot day one part of the team ensured that the door stayed closed to keep the heat out. Categories: Vignerons, Wines | Tags: Bottling wine, Carignan Noir, Flambadou, la mise, Maccabeu, magnums, mise en bouteille, palox | Permalink. How do you follow the Perfect Day? Apparently you just wait and, like the proverbial London bus, two come along together. March 8th dawned chilly, just 2°C when I left Margon at 8am, bright and clear, a perfect day for the last Spring bottling. The biodynamic calendar was favourable too, last day of the descending moon and a flower day. In fact we started with a morning of habillage (labelling and packaging). The start of a longer process of habillage to prepare wines to send to cavistes around the world, it’s time to earn some money! This morning palettes of ‘5SO Simple’ and ‘7, Rue De La Pompe’ were put together, a smooth enough process as Jeff, Michel, Vincent and I have all done this many times now (I’m getting to be an old hand!). One interesting feature is how different regions require different labels, customs stamps and even palettes, the USA different to Europe for example. So making sure you have the right matériel demands some time and attention. So far, so good. The banter was enjoyable as ever, Icare provided some amusement when, hiding under the rollers, he gave himself a shock when a case of bottles passed over his head. The day improved with the arrival of Thomas, a sommelier who spent time with us at vendanges, excellent company. However, the day then took an unexpected turn for the better with a phone call from Sylvain, one of Jeff’s myriad friends. He is a scientist, intellectual and fisherman and phoned to say he was on his way. With him was a cool-box full of sea urchins, sea bass and black mullet – all freshly caught. So, just after noon, we repaired to 7, Rue De La Pompe, the house rather than the bottle. There Sylvain prepared a feast. The oursins, fresh with their delicate tongues of iodine, concentrated flavours of the ocean; a sea urchin butter spread on fresh bread; sashimi of bass and mullet; sea bass marinated in olive oil and Jeff’s white wine vinegar; sea bass chips (little fried nuggets of flesh and skin); chunks of bass and mullet fried lightly in a tempura beer batter; fish egg omelette; barbecued sea bass; black mullet grilled with broccoli, then coated in a Japanese sauce. Totally delicious, everything was a delight, every morsel. The freshness of the fish and Sylvain’s imagination and skill provided us with a 3 hour banquet, conversation around the role of fish and wine in religions, lighter topics too. Sometimes I have to pinch myself. Snow Balls 14, that curious cuvée of Sauvignon Blanc, Grenache Gris, Muscat and others, it shouldn’t work but it always does – so fresh, clean, dry and fruity, a perfect match with the sashimi for example. 5SO Simple 15, ( the best 5SO ever? ), perfumed cherry Cinsault, dangerously fruity and moreish but with a little more texture this year. A good match for the cooked fish with its cleansing acidity. La Vigne Haute 2010. Oh my word. This is my favourite Coutelou cuvée and the 2010 is stunning. Pure, pure Syrah, bottled joy. Deep brambly red fruit scents, as you sniff the wine you are drawn in to the luscious aromas. Rich, smooth texture with the softest of tannins supporting it, cassis and red fruit flavours and soooo long with flavours of chocolate and coffee emerging. OK I’m sounding poncey but seriously, this is fantastic wine. It will improve for a few years yet and I have some in my ‘cellar’, happy man. An indulgence, the whole meal. The kind of life affirming meal which everyone should enjoy from time to time. And yet, back to bottling on this clear, fresh day. A special cuvee, one of the little cuvées. A barrel of Maccabeu and Grenache Gris from 2012 which will be named after the top Spanish ham, 5J. The aim was to produce a wine like a light Fino, slightly oxidised but concentrated and fresh to match those hams. The barrel was formerly used for making cognac (adding more flavour) and the wine succeeds in its ambition. It resembles a light fino, it is dry and the slight oxidation adds complexity but it is the clear fruit which lingers, lifted by that barrel influence. I was reminded of the Jura white wines I love, a Ganévat for example, but the fino / light amontillado sherry reference rings true. It is utterly delicious. 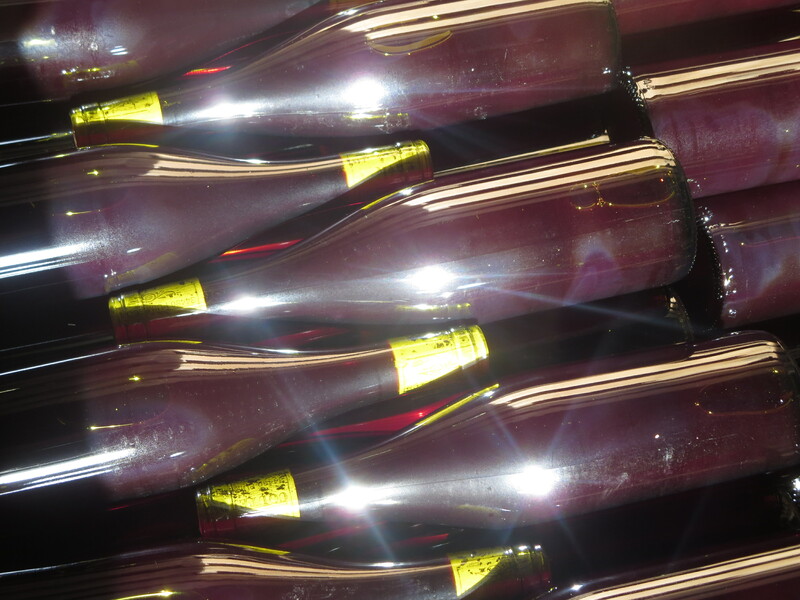 A special cuvée demands a special bottle, so 50cl flute bottles were used with a glass stopper rather than a cork. Just a few hundred bottles of something very special. The barrel was then refilled with some of the top quality Maccabeu of 2015, ready for another delight in a few years. The treats continued though. Little fish are sweet. These were the words used by one of my heroes, WA (Arthur) Stephenson. He was a hugely successful horse racing trainer from my home area in County Durham and when his horse won the Cheltenham Gold Cup (jump racing’s top race) in 1987 he explained why he was at his local track instead of at the big meeting, “little fish are sweet”. As I had referenced Bowie last time I thought it was an apt and indulgent reference to the great man, who shared his time and thoughts generously whenever I spoke with him. There was time to taste the Grenache wine which I made for my 100th blog post with the help of my friends. I intend to write a little more about this, suffice to say that the wine is developing very well in two different sized barrels and one super-sized glass bottle. A tasting too of the 2015 Grenache Sélection De Grains Nobles, quietly maturing. Dark plummy colour, rich and round but it was black grapes that I could taste believe it or not with a sweet, raisin edge. A wine to wait for, and it will repay the patience I am sure. Finally, a 40 year old Muscat. Figgy aromas, black olive and molasses. No sign at all of tiredness just intense, thick, sweet nectar yet still an acidity to keep it in balance. Liquid sunshine, a long past summer captured in a bottle, revived in the glass for us. A perfect end to (another) perfect day. Categories: Tasting, Vignerons, Wines | Tags: 5J, 5SO Simple, 7 Rue De La Pompe, Grenache, Grenache Gris, habillage, La Vigne Haute, Maccabeu, Mas Coutelou, mise en bouteille, Muscat, Snow Balls | Permalink. Any excuse to include some Bowie who is producer and piano player on the song which is also one of Jeff’s favourites. March 3rd was the last full day of the Spring bottling period and it was pretty much a perfect day in Jeff’s own words. The day was clear with high(ish) air pressure which is better for bottling and in the biodynamic calendar it was a fruit day with a descending moon, perfect too. The only snag was the late arrival of the magnum bottles despite being ordered some time ago. 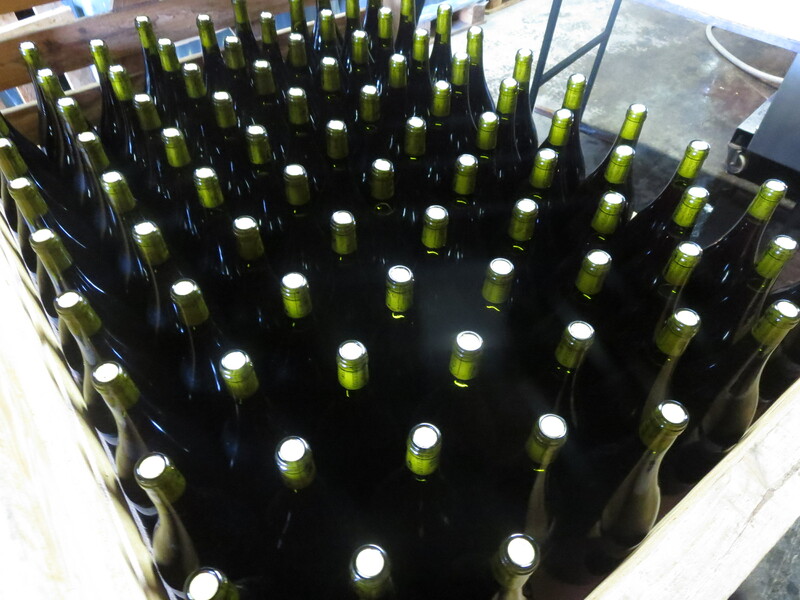 So, things started over an hour late, bottling magnums and jereboams of Vin Des Amis and a new Syrah cuvée. I had always assumed that a magnum being simply 150cl as opposed to the single bottle 75cl would be cheaper to produce, a bulk saving. 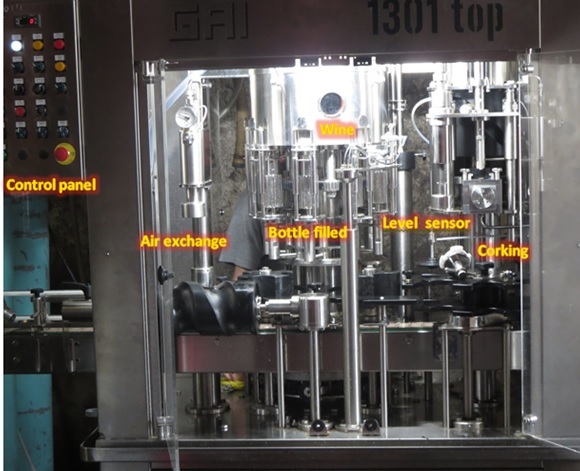 However, the bottles are naturally more expensive, being produced in smaller quantities and they are filled by a slower machine rather than the usual bottling line. This takes more manpower too. So a magnum and other large formats do cost more, jereboams also need a larger cork. I like these large bottles, not just because there is more wine (good for groups of friends) but also the wine ages more slowly. 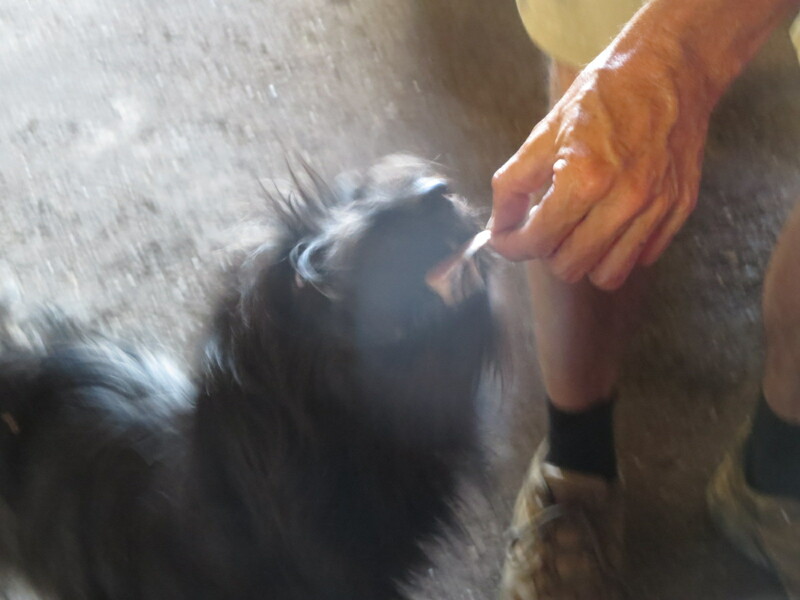 We had a relaxed lunch in the cellar, cheese, canned fish and charcuterie, the latter for Jeff, Michel and Julien. Naturally a few bottles were opened for quality control! 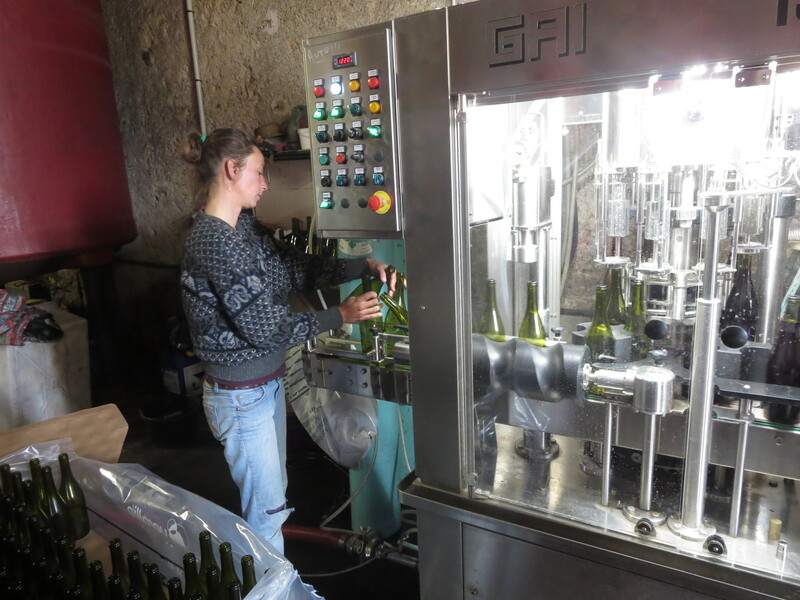 In the afternoon it was back to the main bottling line, helped by Catherine, for the Syrah cuvée and the new white wine from Peilhan vineyard, made from Carignan Blanc and Grenache Gris. The Syrah is lovely, I remember during the vendanges that the tank caused some of us some concern but Jeff always believed in it and …. he was right. Lovely dark fruits, fresh, mineral and long – almost as good as La Vigne Haute which is praise indeed. The Blanc was, perhaps, even better for me, bright apple and pear flavours, very mineral, clean and pure. 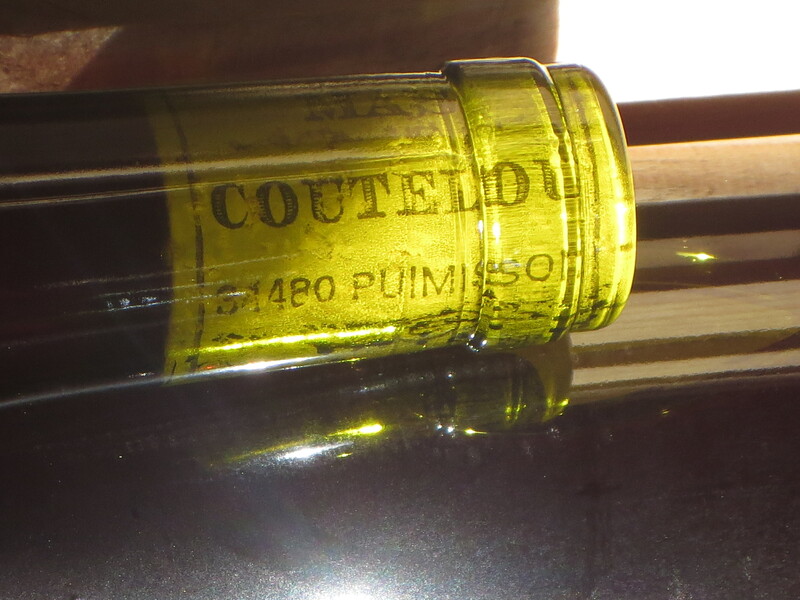 I do believe 2015 will produce some great reds from Mas Coutelou but that the white wines, often in the shadow, will emerge to take their place as stars in their own right. Jeff is confident that the Maccabeu is even better, there’s a long maceration blanc too. I have tasted them both and they are lovely wines in the making. We didn’t finish until after 8pm, it was a long day but we had great fun, lots of laughs, great teamwork as well as the hard work. The bottling has been a success, the 2015s are proving to be even better than we thought – a perfect day. How much is left Michel? Then just as I thought days could hardly get much better, along came Tuesday, March 8th. But you’ll have to wait for that report in a couple of days. Categories: Wines | Tags: bottling, Carignan Blanc, Grenache Gris, jereboams, magnums, mise en bouteille, Peilhan, Syrah | Permalink. Last Friday and Saturday, June 5th and 6th, was full steam ahead at Mas Coutelou, almost literally given the high temperatures. 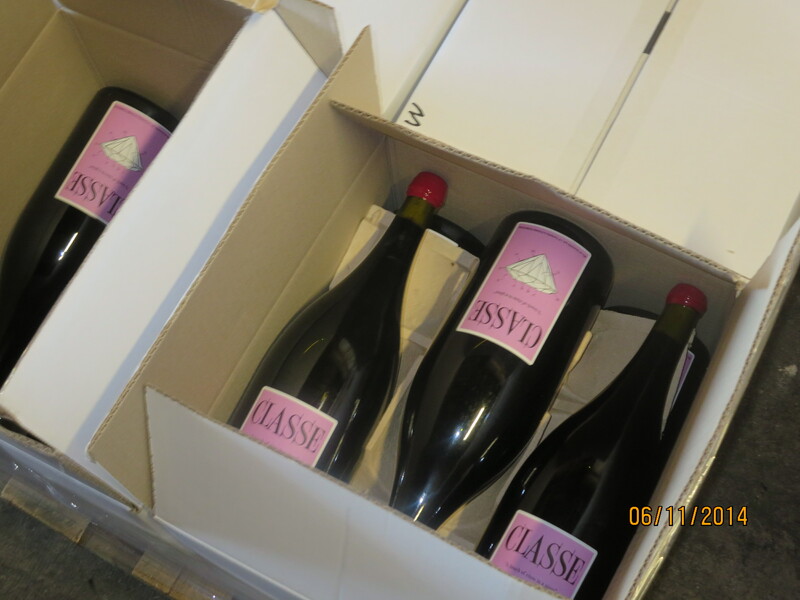 It was time to bottle some cuvées and especially one of the largest productions, the popular Classe. The moon was descending so Jeff thought this a propitious time to bottle as this usually brings lower air pressure. 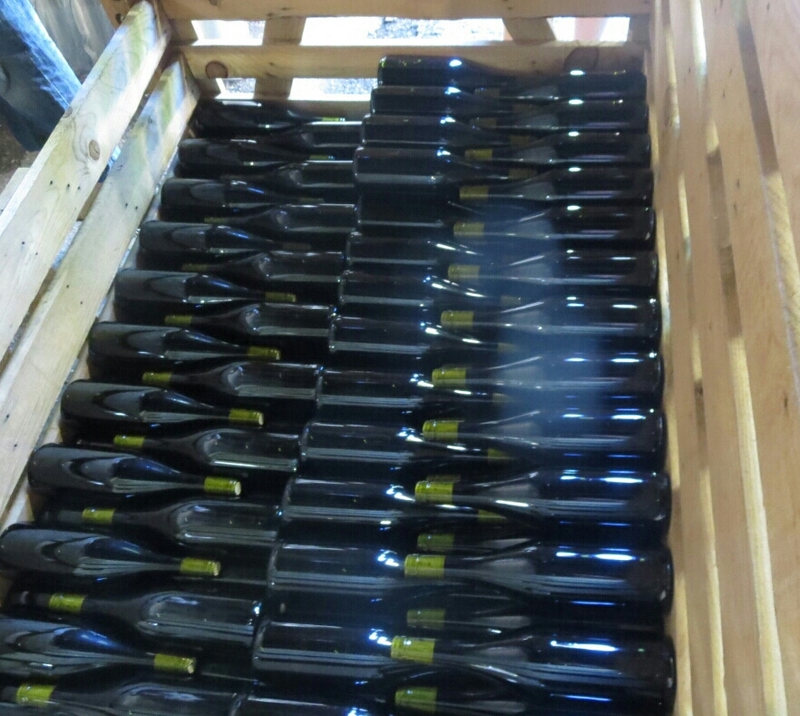 On Friday around 2,000 bottles were filled with 2 cuvées, Blanc Frisant and Tête À Claques. The former is a white wine made from Macabeu and Grenache Gris but it’s fermentation is halted to allow some residual sugar to remain, this ferments slightly in bottle and so creates a slight spritz making the wine even more refreshing. The 2014 had around 9g of residual sugar meaning there would be spritz without creating too much pressure that a special cork would be needed. Tête À Claques is a special cuvée made for Roberson Wines in the UK and is usually destined for restaurants such as Hawksmoor. It is made from the same grapes as Vin Des Amis with added extras and is yet another winner. When I tweeted pictures of the bottling to them Roberson and Hawksmoor were so pleased they called it Coutelou Party! 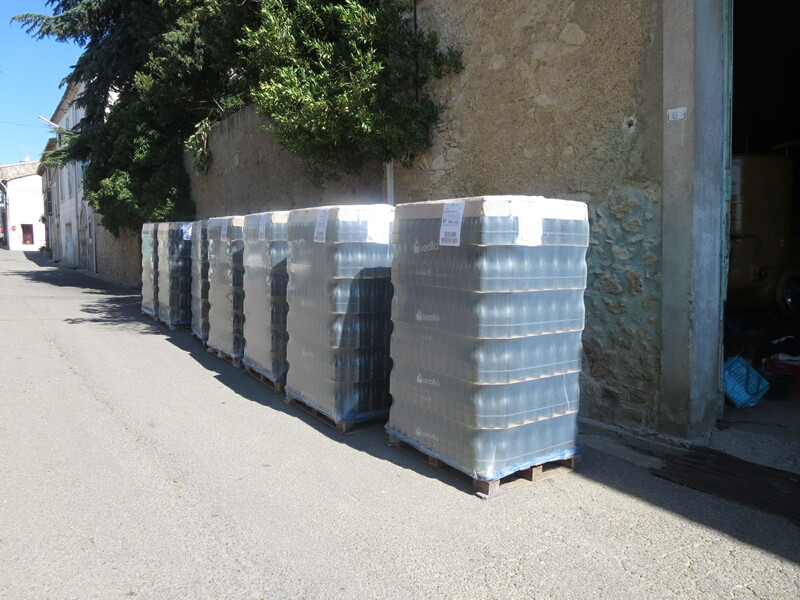 Then preparations were made for Saturday as this would be a much bigger bottling, 11,500 bottles of Classe. Work began at 7am and ended around 6.30pm, non-stop. The team worked tirelessly even as temperatures outside reached 35c. Even after all the bottling there was work still to do. Everything had to be cleaned thoroughly, the bottling line, the tank where the wine developed the pump, everything. 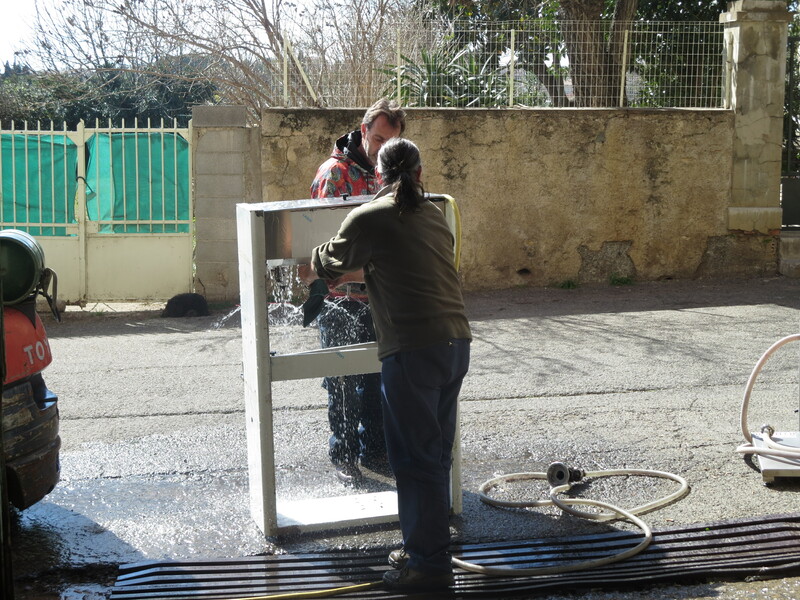 Hygiene is essential in all winemaking but especially when using no sulphites. The team needs some introduction. 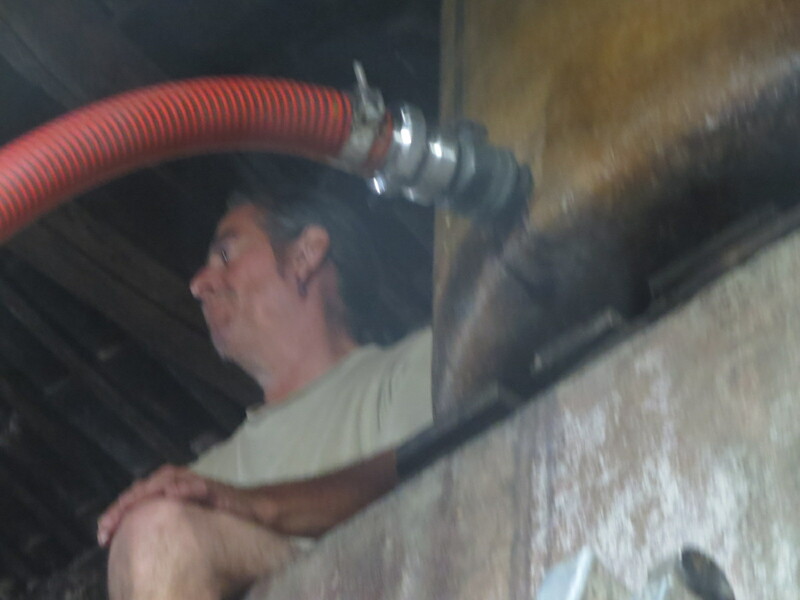 Michel is from Puimisson, has worked for Jeff for many years now and drives the team on with his knowledge of work in the vineyards and cellar. Honest, hard working and ever cheerful, Michel is a reflection of the wines he helps to produce. 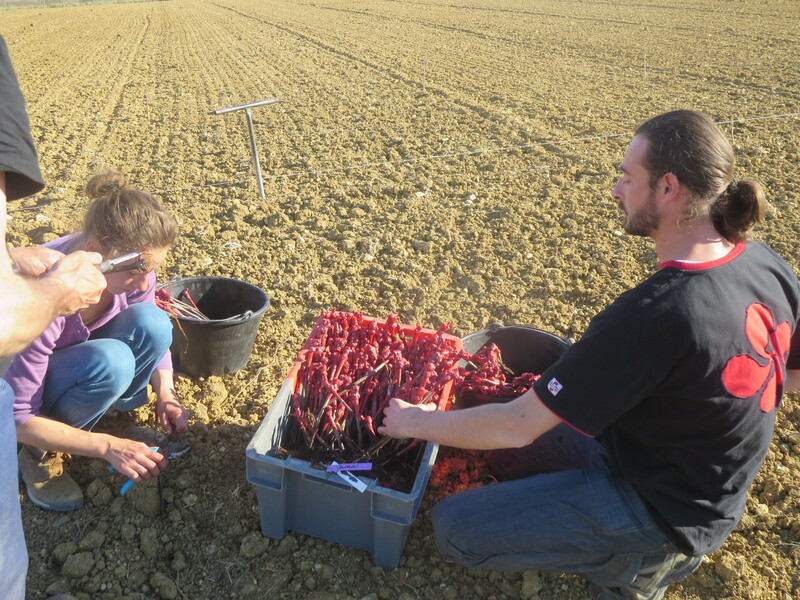 Carole has featured many times in this blog with videos of her working in the vineyards, e.g. pruning and debudding. 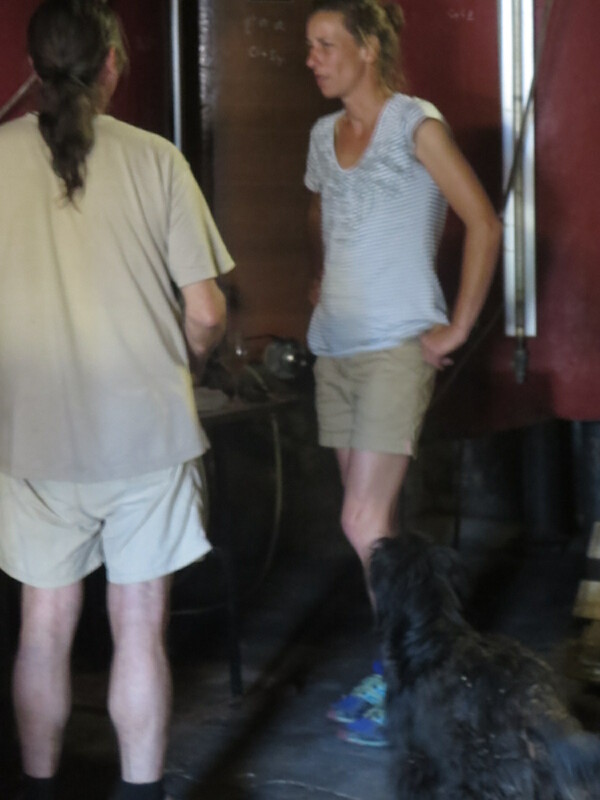 She is from the Loire and has worked in vineyards there and in other parts of France and other countries. She is a true expert, has great knowledge of wines and has great patience in talking me through the work she does. She also shared an excellent bottle of Domaine L’Ecu Muscadet Granit 2011, which was a revelation to me. In addition we shared a fantastic Cornas Brise Cailloux 2012 from Barret, fruity, long and structured beautifully. Renaud now lives in Puimisson and has started working for Jeff regularly in the last year. He works hard, has a mischievous sense of humour and is a good man to have around. He is learning from Michel and Carole and helps me a lot too. We also welcomed visitors to the cellar, including sommelière Sandra Martinez who brought along a very interesting wine from Domaine De Cressance in the Gard. Largely based on Chenanson, a new grape to me, apparently a cross of Grenache and Jurancon Noir. It was very good, long liquorice flavours and refreshing. Sandra and her friend Isabelle set to work with enthusiasm and became a welcome part of the team. The well known wine writer Guillaume Deschamps also called by, it was good to meet him as I have admired his writing for some time. And of course there is the boss, Jeff himself. Passionate about his vines, his wines and nature. Tireless in working to make them healthy and top class, and doing so successfully. He knows every job, supervises his team, leads from the front. And has a great team who are loyal and willing to push themselves to help him to achieve his goals. They really are all Classe. Meanwhile they are all very tolerant and welcoming of this Englishman doing his best to learn and to help. 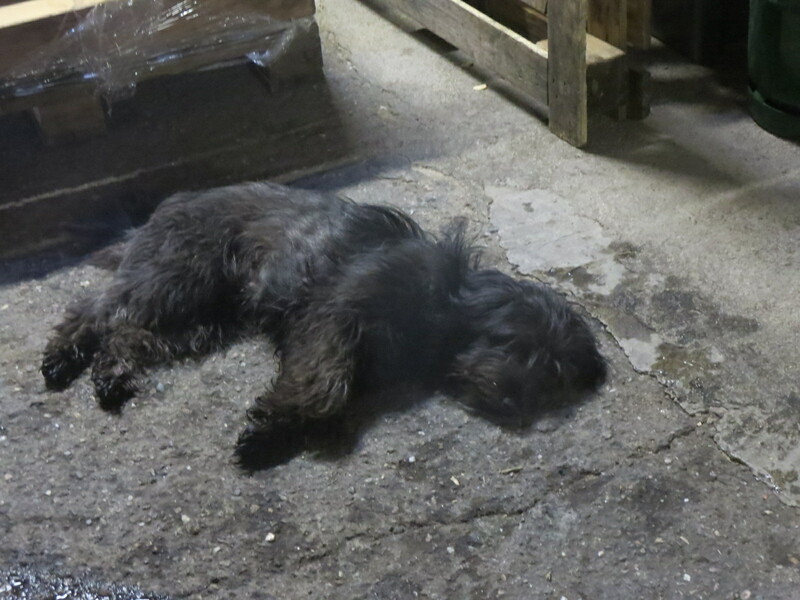 I do some of the jobs around the cellar, stepping in when breaks were taken for example. Hopefully I do actually contribute! It is certainly a huge pleasure for me to be a part time member of the team. 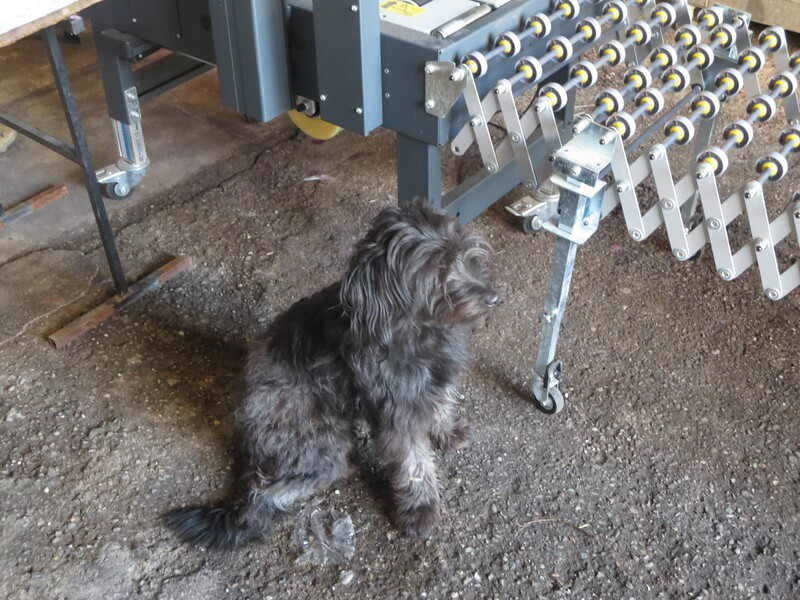 Plus there is one other member of the team who keeps us all entertained and smiling. Icare. Categories: Vignerons, Wines | Tags: Blanc Frisant, bottling, Classe, mise en bouteille, Roberson, teamwork, Tete A Claques | Permalink. Air pressure was high, the moon waning, wind from the north – a good time to bottle wine. Yes these things do make a difference. 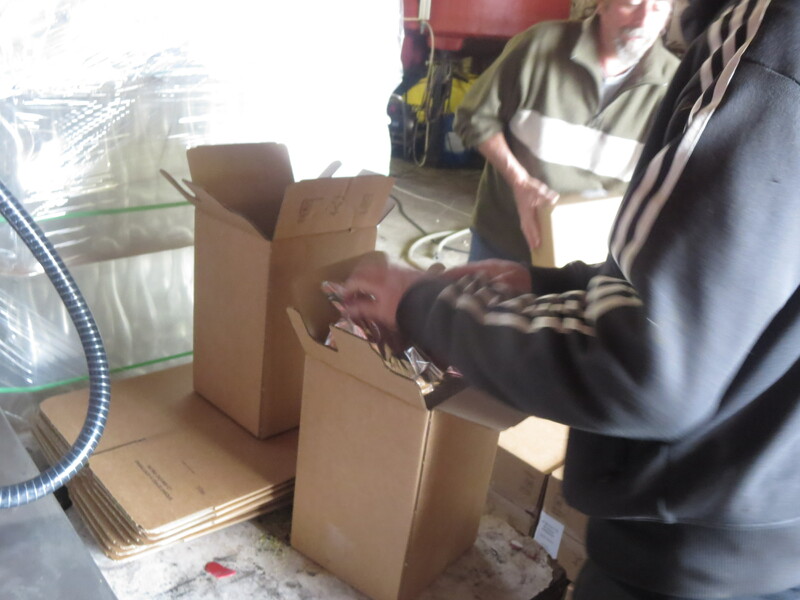 The week of March 9th -12th saw around 10,000 bottles filled with wine and thousands labelled ready for a large wine tasting. 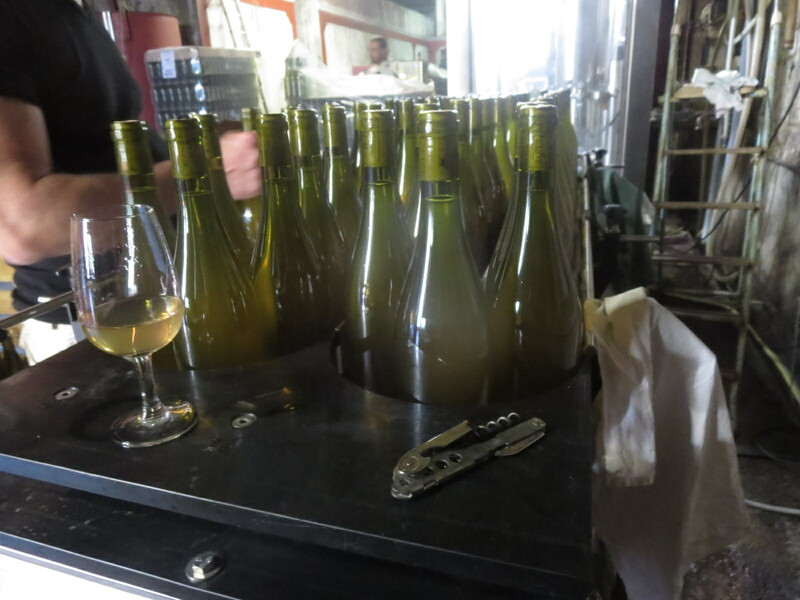 Bottling is a tense time for the winemaker, risks abound. 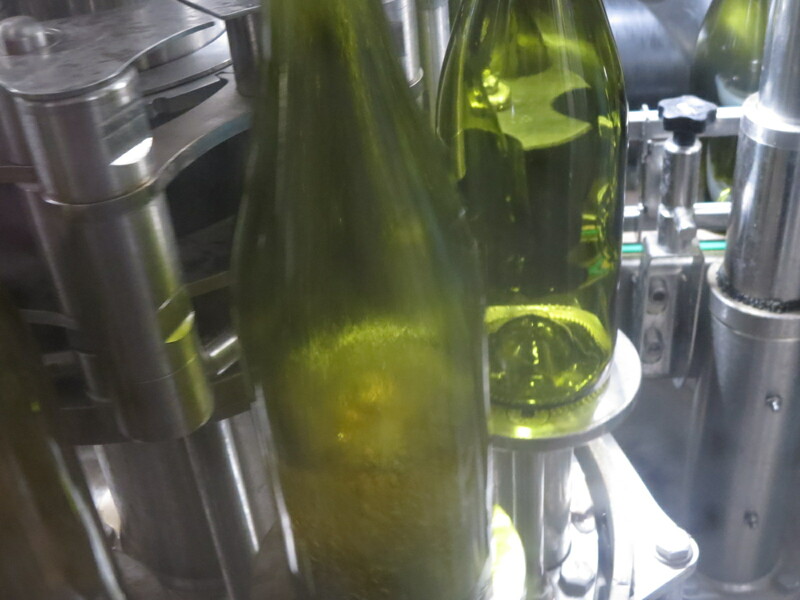 Contamination and exposure to oxygen are the main two risks; it is estimated that the wine interacts with more oxygen during the bottling process than in years inside the bottle whatever the closure. Most winemakers will add sulphur dioxide at this stage in order to protect the wine from bacteria and oxydation, including many who would regard themselves as makers of natural wine. 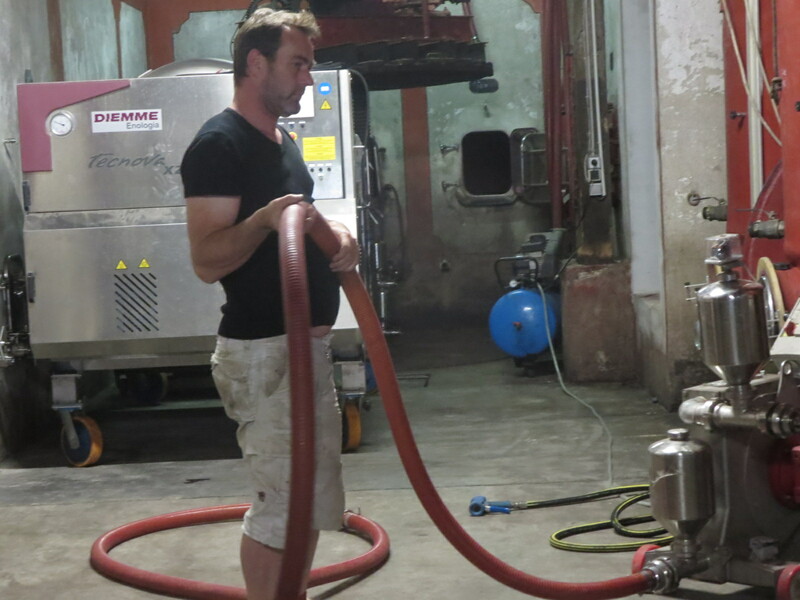 Jeff Coutelou adds no SO2 at any stage of the winemaking process and therefore takes risks. He has to be confident in the health of his wine and everything has to be as clean as possible to minimise those risks. As it happened the stress began before the bottling, the main machine had a part not working and the engineer was late in getting the part. 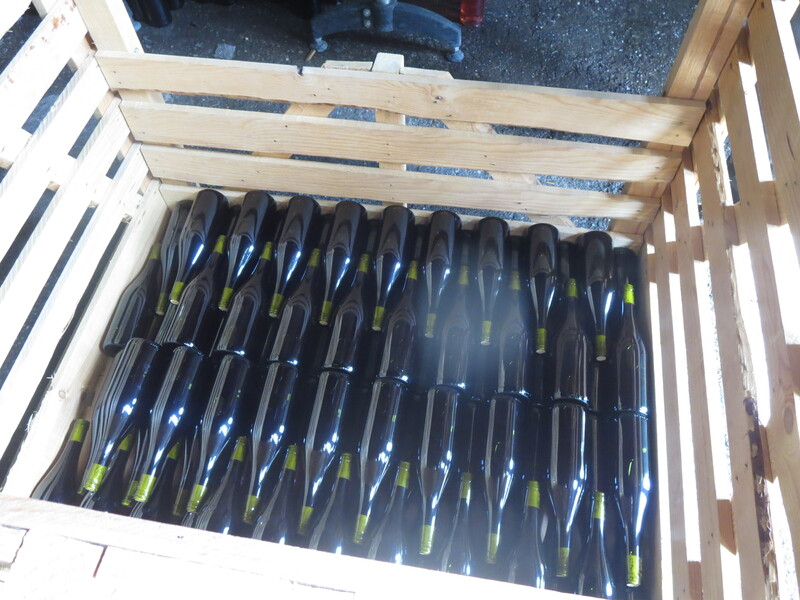 Therefore, day 1 would need to use an older machine to bottle magnums of 5SO, the simpler of the Cinsault cuvées. 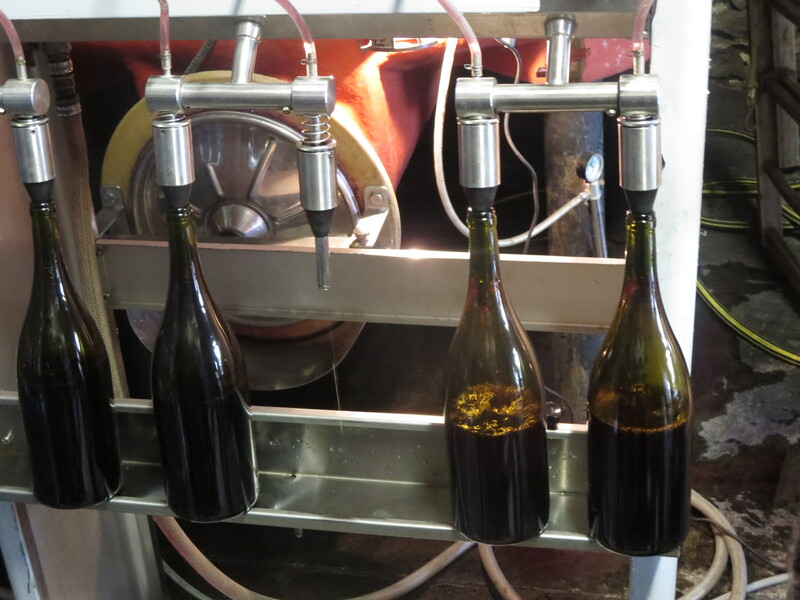 Bottling magnums is a much slower process than single bottles because of the older machine and a separate machine for corking. 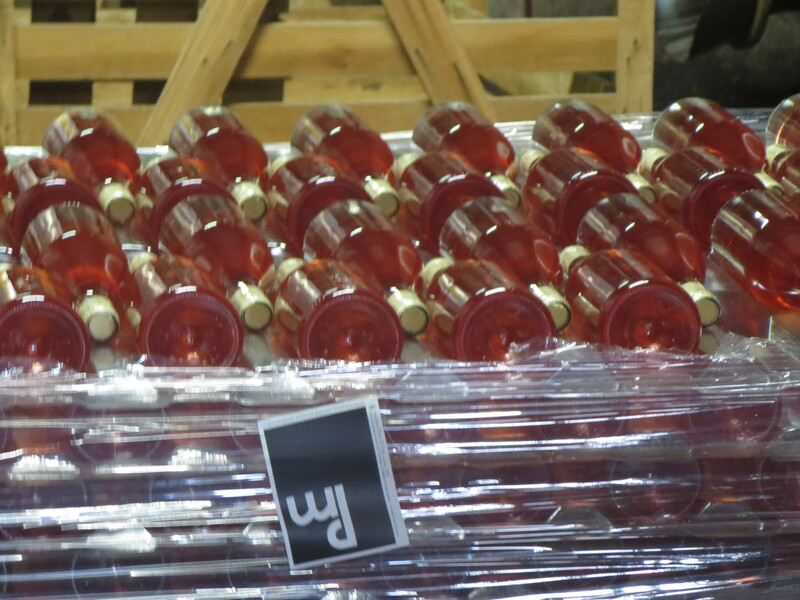 A few hundred can be produced in an hour rather than the 1200 single bottles. The costs are therefore greater even if the bottle retail price will not reflect that. 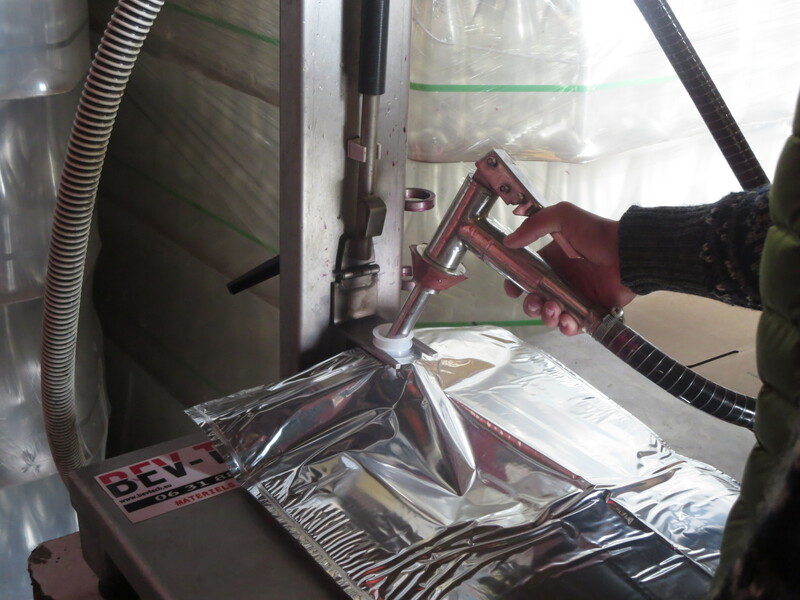 Also produced were bag in box wines (BiBs) which are usually sold to restaurants. This was mostly Merlot wine (from the Le Colombié vineyard). The next day the new part was fitted and the main bottling line was in action. This is an expensive machine but can bottle 1200 bottles an hour whilst controlling the risks of contamination and exposure to oxygen. Carole can be seen here placing the bottles on the machine. It then carries the bottles through the process at the required speed. Inside the main body of the machine the bottle has its air sucked out to prevent any staleness. The bottle passes to the reservoir of wine and is filled. It moves on to a sensor to ensure that the level is correct inside the bottle, and removes or adds wine as necessary.It is important that there is a small gap between wine and cork to allow air inside so that the wine can breathe and develop before consumption. 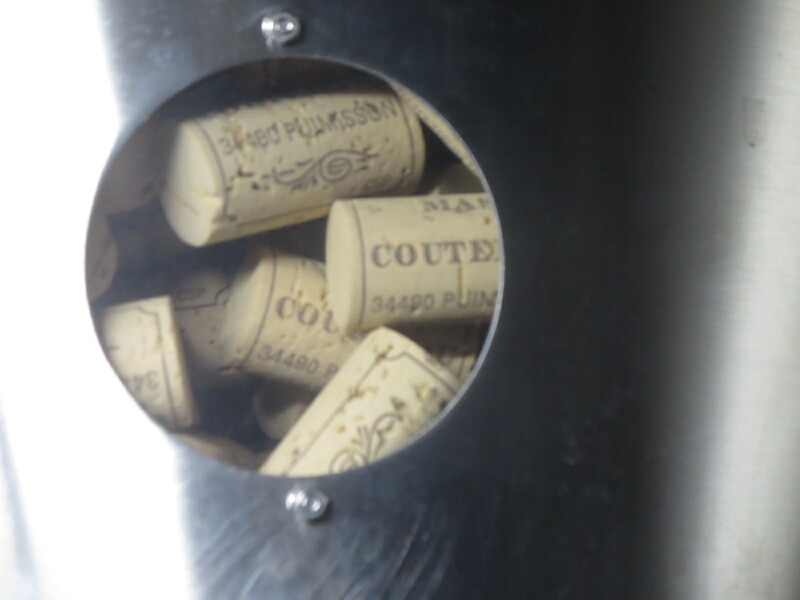 The cork is then driven into the bottle which begins a 3 minute journey around a conveyor belt allowing the cork to expand in the bottle neck so that is properly closed. They do rather resemble penguins waddling or a long queue in the Post Office. This extra video shows the sensor and corking in closer detail. Finally the bottles are stored in large pallets and the sunlight created some stunning colours. As for the wines, well the PM rosé is fruity, refreshing and yet has plenty of texture and length of flavour. However, the 5SO was my star, it is a lighter Cinsault ready for drinking. Immediately after bottling it had a slightly cloudy appearance which began to settle by day two. I opened a bottle on the fifth day and it was delicious, with real depth. Much more than a simple wine. Enjoy! Categories: Vignerons, Wines | Tags: 5SO, BiB, bottling, Cinsault, mise en bouteille, PM, SO2 | Permalink.